The potential issue of immigration fraud is also a concern with Canadians who enter the United States as tourists and then apply to adjust their status to that of a lawful permanent resident through the Adjustment of Status process. The common scenario in these cases usually involves a couple wherein one party is an American and the other is Canadian. In many of these cases the couple lives very close to each other and simply goes back and forth between the U.S. and Canada to visit each other. Inevitably, at some point the couple decides they want to be married and the Canadian wants to immigrate to the U.S. In these cases, if the Canadian is in the U.S. he or she may apply to Adjust Status (AOS) to a lawful permanent resident. AOS has many advantages including the ability of the Canadian national to remain in the United States while the AOS petition is pending. Additionally, the process is generally much faster than applying for an immigrant visa through the USCIS and U.S. embassy or consulate in Canada. The risk with this approach is that one who enters the U.S. on a visitors visa with the intent to immigrate may be found to have committed immigration fraud. Whether or not immigration fraud has been committed depends on the intent the Canadian national had at the time of the entry. 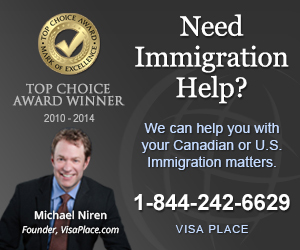 For example, if the Canadian entered the U.S. with the intent to immigrate and avoid the lengthy USCIS processing, National Visa Center processing and consular processing that is involved in applying for an immigrant visa abroad this would be immigration fraud and can have serious consequences. As a practical matter, this can be very difficult for the USCIS to establish and, in my experience is not generally an issue at USCIS Field offices who commonly adjudicate AOS cases involving Canadians such as Detroit. That being said, it is a serious issue that must be addressed and carefully evaluated on a case by case basis. Furthermore, there are some things that CBE officers look for when Canadians are entering the U.S. as visitors which might result in the denial of their entry in the first place. For example, a Canadian who shows up a the border with a U-Haul truck full of personal belongings will likely run into some trouble trying to establish they are entering just for a visit. This type of thing could also be a problem later during an AOS petition as it evidences an intent to immigrate at the time the Canadian entered as a visitor. USCIS officers when adjudicating AOS petitions for Canadians who entered without visas also look at how quickly after the entry the couple was married. If the couple marries quickly (within 90 days or less of entry) can raise a presumption of immigration fraud. While this issue is not raised by the USCIS with much frequency it is not advisable for Canadians to enter as a tourist with the intent to immigrate and file for AOS. It is not a problem if the Canadian enters the U.S. without intent to immigrate on the visit at the time of entry but later changes his or her mind. As mentioned earlier, these things don’t come up often and it is difficult for the USCIS to establish the state of mind of the AOS applicant at the time of entry to the U.S. but the consequences of a finding of immigration fraud can cause serious problems so it is not an issue to be taken lighting and should be discussed with a qualified immigration attorney.